the biggest sticky bun in the world! 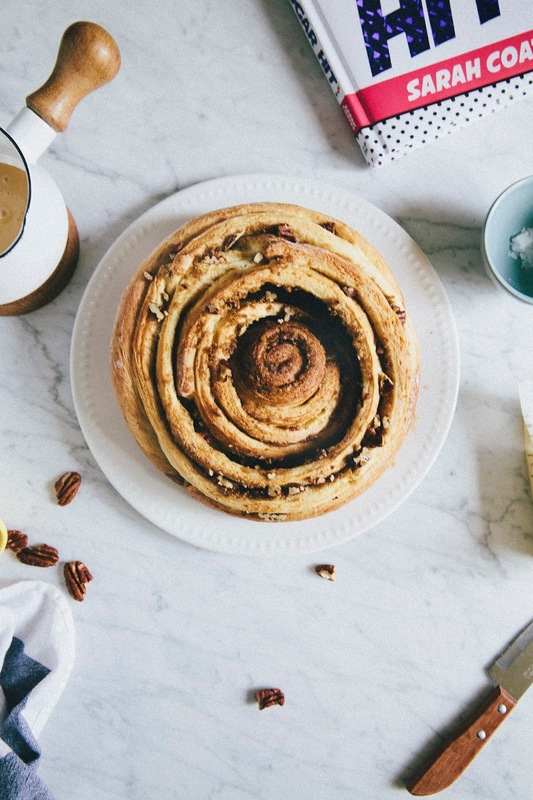 Okay, disclaimer: this is not actually the biggest sticky bun in the world. 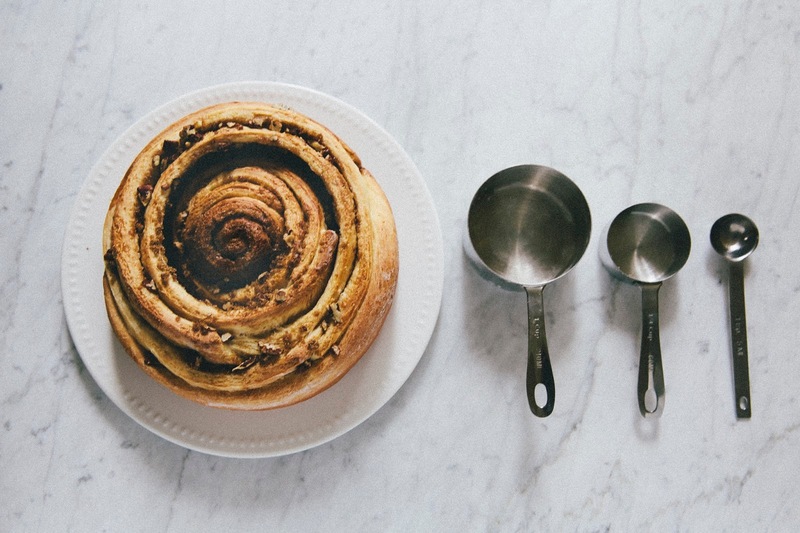 The world's largest cinnamon bun is apparently 6 feet in diameter and weighs around 600 pounds. Oops. In my defense, when I pulled this bad boy out the oven, it certainly felt like I had made the world's largest sticky bun. Weighing in at around two and a half pounds, my bun was around 9 inches in diameter... okay, sure, when you put it like that, it doesn't sound anywhere close to the current record holder — but still! 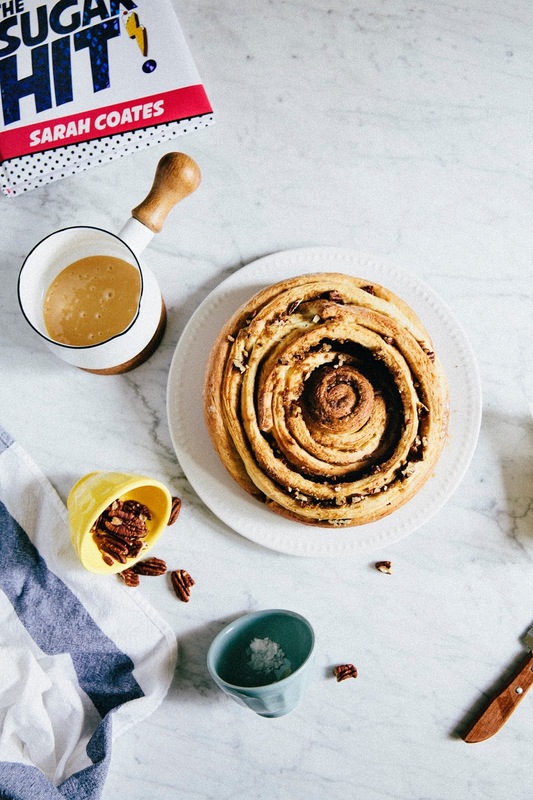 This is definitely not your everyday, out of the ordinary sticky bun. This crazy fun recipe comes from the brand, spankin' new cookbook of one of my blogger friends: Sarah from The Sugar Hit. With millions of food blogs out there, Sarah stands out with her unique voice, fun comic-book inspired design, colorful photography, and most of all, crazy fun and incredibly inventive desserts. I'm not really a big believer in the concept of soul mates, but when I scroll through Sarah's blog, I definitely recognize a kindred spirit — girl loves sugar, desserts, and baking as much as I do! In a world that celebrates healthy (often times, paleo, vegan, or gluten-free) diets, Sarah is unabashedly and unashamedly posting recipes for brownie cake topped with cotton candy, cupcakes baked in sugar cones, peanut butter and jelly donuts, and more. Respect. Her cookbook is a testament to this fun, adventurous approach to baking. Flipping through her book, I couldn't decide what recipe to make first — blueberry and almond morning buns! homemade tim tams! passionfruit s'more cones! blackberry ripple custard donuts! candy bar layer cake! — the possibilities were endless and all equally exciting. I finally settled on Sarah's recipe for a giant cinnamon bun. 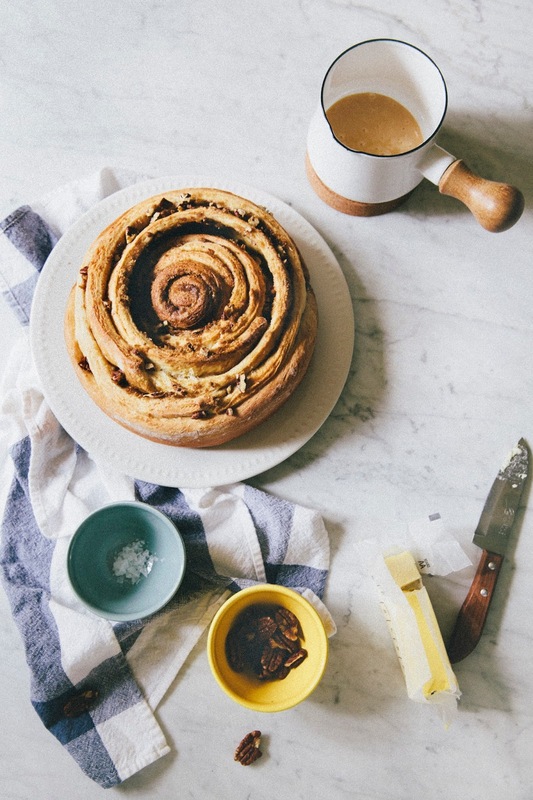 I thought that baking a big sticky bun would be the best celebration of Sarah's even bigger accomplishment of creating such a kickass, epic cookbook. Congrats girl! 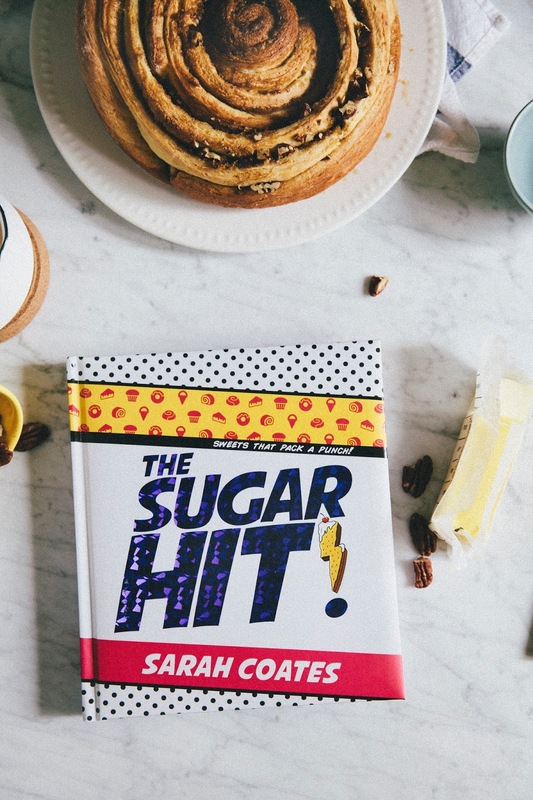 Be sure to check out Sarah's new cookbook, The Sugar Hit!, which is out in stores and online in the USA today! No major notes on this one! The recipe is taken directly from Sarah's new book, and worked perfectly. I only made one substitution — instead of serving the bun with her cream cheese frosting, I served it with some lightly salted dulce de leche spiked with a shot of brandy (a combination also inspired by another recipe in her book, dulce de leche crepes!). Dulce de leche is available online, or in specialty grocery stores like Whole Foods or Trader Joe's. Alternatively, you can make it at home! I like Naomi's recipe for homemade dulce de leche. First, make the dough. In a small saucepan over low heat, melt 5 1/2 tablespoons (2.75 ounces) unsalted butter, add 3/4 cup (6.5 fluid ounces) whole milk, then remove from heat and set aside to cool slightly. In the bowl of a freestanding electric mixer fitted with a dough hook, use a rubber spatula to briefly combine 3 cups (1 pound) all-purpose flour, 3/4 cup (2 ounces) granulated sugar, 1 1/2 teaspoons active dry yeast, 1 large egg, and a pinch of kosher salt until the mixture appears damp. Add the slightly cooled milk and butter mixture, and again, use a rubber spatula to incorporate the liquid into the dry ingredients until the mixture looks moist and shaggy. Turn on the mixer to medium-low and knead the mixture for 2 to 3 minutes until a smooth, elastic, and ever-so-slightly tacky dough forms. At this point, the dough should be one giant lump in the center of the bowl, concentrated around the dough hook. Use a rubber spatula to scrape the dough off the dough hook and into the bowl. Cover the bowl with plastic wrap and leave n a warm place to rise for 30 to 45 minutes, or until double in size. While the dough is rising, prepare a 9-inch round springform cake pan by spraying generously with cooking spray and lining the bottom of the pan with parchment paper. Spray the parchment paper as well. When the dough has risen, punch it down and turn it out onto a lightly floured work surface. Roll the dough out into a 12-inch square. Use an offset spatula to evenly spread 2 tablespoons (1 ounce) melted unsalted butter over the dough and sprinkle evenly with 1/2 cup (4 ounces) brown sugar, 1 tablespoon ground cinnamon, and 1/4 cup (1 ounce) chopped pecans. Make sure you cover the entire surface of the square, sprinkling the filling up to the edges of the dough square! Use a pastry wheel, bench scraper, or a serrated knife to slice the dough lengthways into 6 equal strips that are around 2-inches each. Roll the first strip up into a spiral, just like a regular cinnamon bun. Roll the next strip around this spiral, and then another one until each of the strips are wrapped around the original spiral. 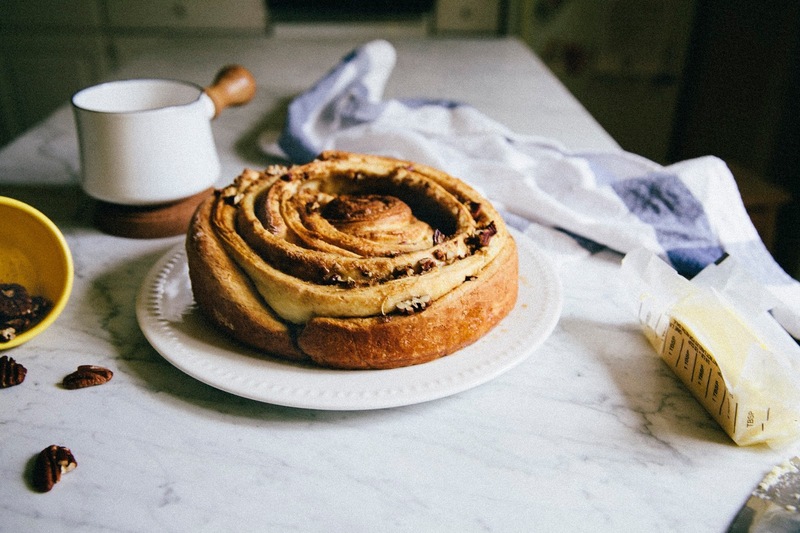 You should end up with a very ramshackle giant cinnamon roll. Now plonk this giant bun in the greased tin. 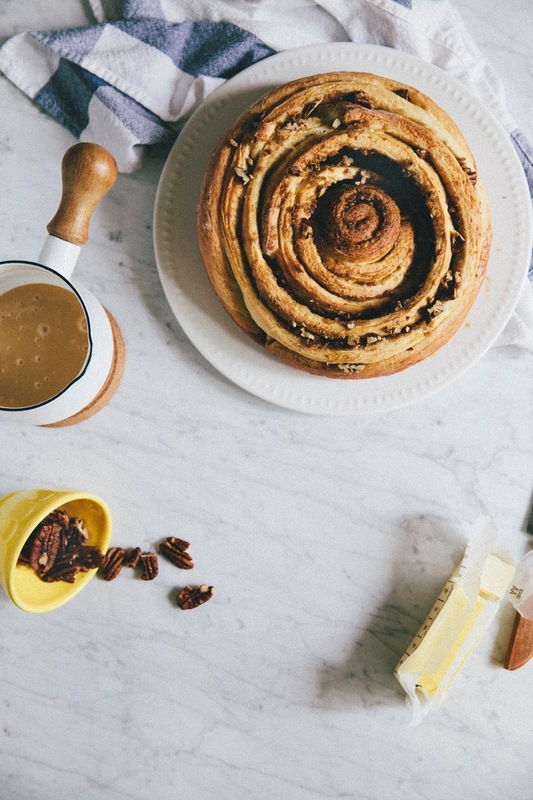 If you lose any of the filling during this process, use a bench scraper to gather any sugar, cinnamon, and pecans that fell out and sprinkle over the top of the roll. Cover the tin with plastic wrap and set aside for about 45 minutes to rise and double in size. While the bun is rising, center a rack in the oven and preheat to 350 (F). After the bun has doubled in size (the bun should now take up most of the springform pan), remove the plastic wrap and bake in the preheated oven for 35 to 45 minutes, or until golden, risen, and cooked through. Remove the bun from the tin and leave to cool on a wire rack until just warm. While the bun is cooling, pour 1/2 cup (4 fluid ounces) dulce de leche in a small saucepan over low heat. Whisk until the dulce de leche begins to soften and smoothen over the heat. Remove from heat and whisk in 1 1/2 tablespoons brandy and a pinch of kosher salt, before drizzling over the warm cinnamon bun. Claim faucet bitcoins over at Easy Bitcoin. 11 to 33 satoshis per 10 minutes.